The curved edge display is what sets the Samsung Galaxy S6 Edge apart from other smartphones like it. With this unique screen design, you can view messages and notifications even if your phone is turned over. As impressive as the screen on the Samsung Galaxy S6 Edge is, it is still prone to developing problems over time. 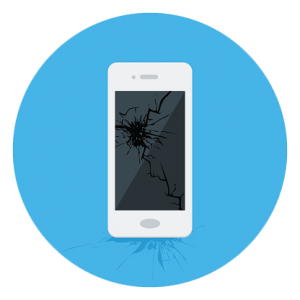 Common screen problems affecting this phone include scratches, cracks, and a broken screen. If your Samsung Galaxy S6 Edge is in need of screen repairs, stop in to VG Phones for a free consultation – you won’t be disappointed. Galaxy S6 edge screen repairs, please tell us your model. Is the glass of your Samsung Galaxy S6 edge broken and the LCD defective? - If your phone looks like in the picture, then the glass is broken and the LCD is defective. Accidents happen, but that doesn’t mean you should have to blow your entire budget on an expensive new replacement phone. Instead, choose our mobile phone repair service to get your Samsung S6 Edge fixed. Either mail us your smartphone (sending us your phone and battery, but not the charger), or stop by our shop in Melbourne. Many Samsung S6 Edge repairs can be made the same day, and we even provide 3 months warranty on our parts and labor. Our skilled technicians have repaired thousands of phones and we can guarantee that your Samsung Galaxy S6 edge will work perfectly again. We carry out express repairs in our own workshop, i.e. we do not send the phone to another service provider. This allows us to have the fastest and cheapest service in the market.